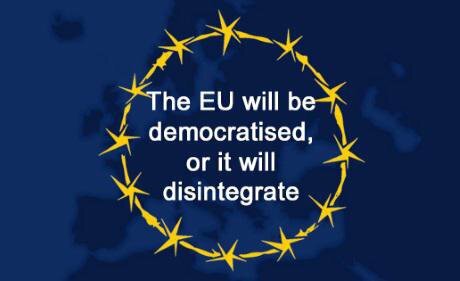 OUT won because the EU establishment have made it impossible, through their anti-democratic reign (not to mention the asphyxiation of weaker countries like Greece), for the people of Britain to imagine a democratic EU. DiEM25 campaigned vigorously in favour of a radical IN vote. Our radical IN campaign was thus defeated. We, at DiEM25, are in no mood for being downcast now that Leave won, against our better efforts. As of today, a new exciting challenge begins for our pan-European democratic movement. At DiEM25 we rejected the logic of EU disintegration implicit in the Leave campaign. But we also rejected the logic of business-as-usual for the EU peddled by David Cameron, Tony Blair, Wolfgang Schäuble, Francois Holland, Jean-Claude Jüncker, Hilary Clinton and all the other contributors to the loss of EU’s legitimacy, integrity and soul. DiEM25 regrets that the British people chose to leave in the EU. But at the same time, DiEM25 welcomes the British people’s determination to tackle the diminution of democratic sovereignty caused by the gross de-politicisation of political decisions and the consequent democratic deficit in the EU. As of today, DiEM25 will seize upon the OUT vote to promote its radical agenda of confronting the EU establishment more powerfully than before. The EU’s disintegration is now running at full speed. The DiEM25 campaign of building bridges across Europe, bringing democrats together across borders and political parties, is what Europe needs more than ever to avoid a slide into a xenophobic, deflationary, 1930s-like abyss. In this endeavour, British progressives will be at the heart of DiEM25’s campaigns.